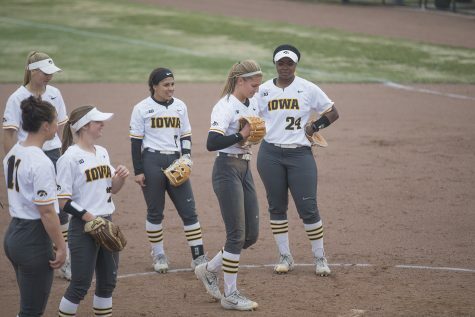 Fresh off of an offensively productive weekend, Iowa softball takes on the high-scoring Drake Bulldogs tonight in Des Moines. 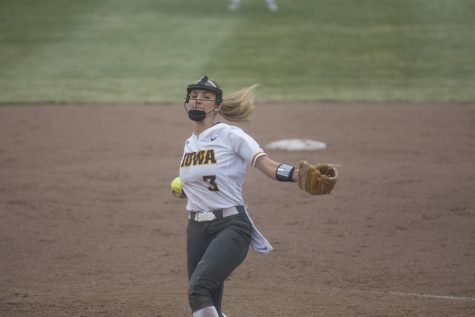 Iowa utility Aralee Bogar watches a pitch during the first game in a double header against Illinois on Saturday, April 13, 2019. Bogar got a walk to first. 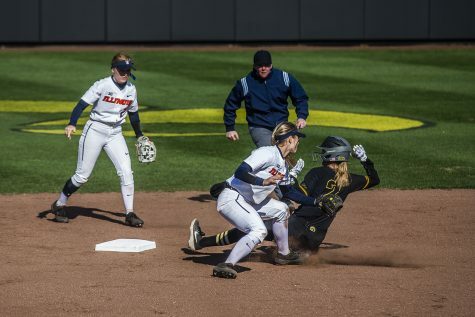 The Hawkeyes fell to the Illinis 12-11 but came back to win the second game. 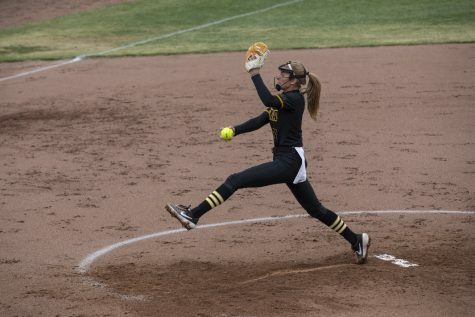 Iowa softball head coach Renee Gillispie told her team that the minute details were keeping it down during its 11-game losing streak leading up to the games against Illinois on April 13 at Pearl Field. The small details also helped the team harness its first win since March 23. With an away game against Drake tonight, the team hopes to keep that focus on the small things to create a second-straight win. 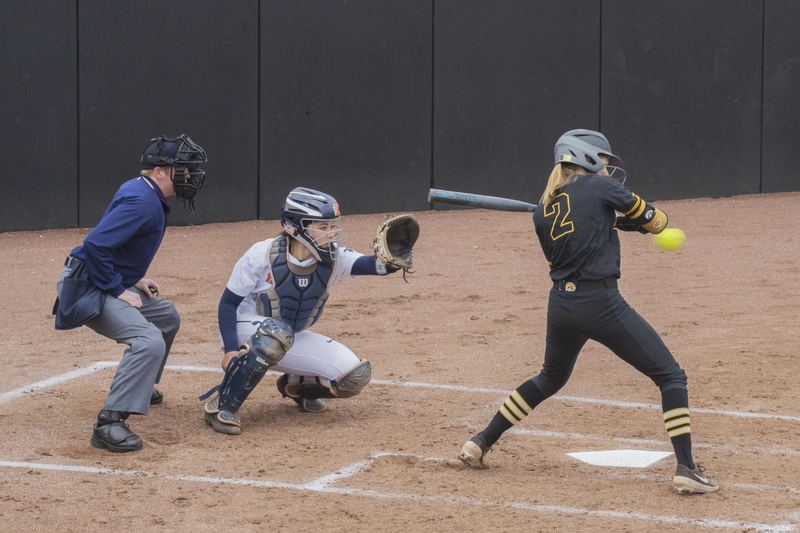 The team finally broke through that streak with a win against Illinois on April 13, taking down the Illini, 4-3. 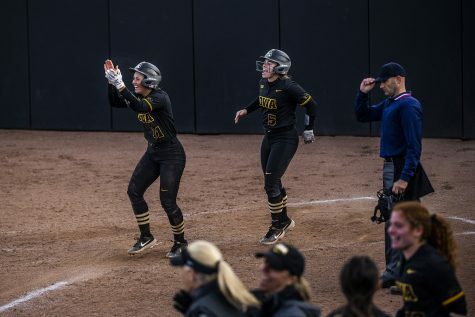 The biggest story of the day was Iowa’s offense: The doubleheader featured 15 Iowa runs on the board, more than in the team’s previous 12 games combined. For the weeks during the losing streak, Gillispie kept iterating that the team’s failure lay in the details. Errors and poor relays were common. When those things occur, she repeated, it negatively affects all facets of a team’s performance. 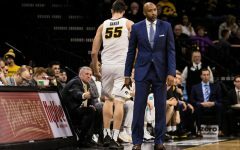 It’s a good time, too, because the Hawkeyes will have to score a ton to beat Drake. 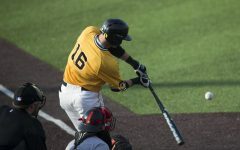 The Bulldogs have been very efficient at the plate, scoring better than 8 runs in seven of their last 10 games. 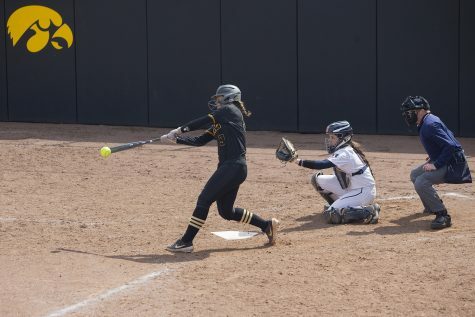 Macy Johnson leads the team offensively, posting a .389 average with 42 hits and 21 RBIs. The Bulldogs are on a 15-game winning streak. 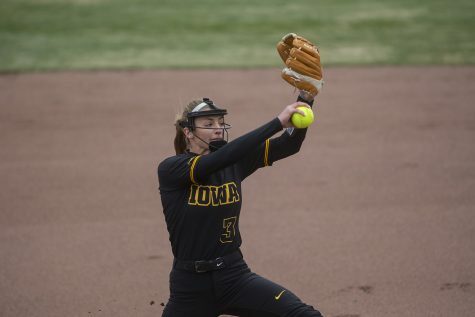 But the Hawkeyes’ biggest batters — who had been quiet for much of the last several weeks — rose in the Illinois series in dominant fashion. 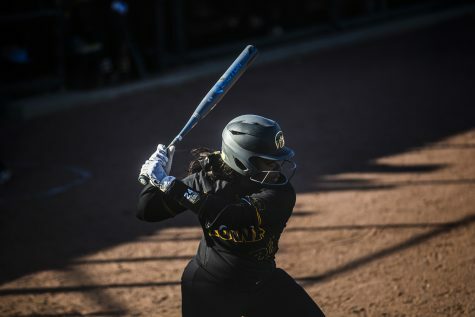 DoniRae Mayhew, who is batting .304, had one of her best outings of the season in the first game on April 13. 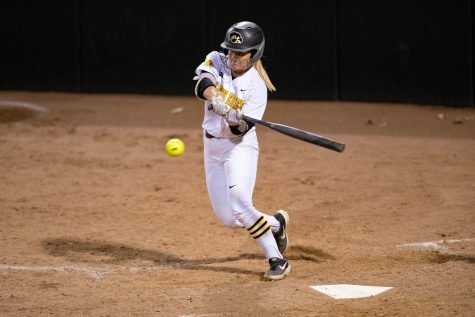 The junior transfer went 4-for-4, scoring 3 runs and putting in an additional 2 RBIs. Because of the weather, the game will take place at 5 p.m. at Buel Field in Des Moines, an hour earlier than its previously scheduled start.